There has never been an activist movement without storytelling being a fundamental tool of it. For more, see Kamilah Stinnett’s companion essay exploring the artifacts produced by racism and how they help shape our everyday notions of race. Storytelling, Hunt says, is essential to effective activism: “there has never been an activist movement without storytelling being a fundamental tool of it.” In American politics, the ability to create a narrative with broad emotional appeal is often the biggest factor in victory and defeat. The ability of the founders to craft a story about monarchical oppression and a vision for the future; the power of Lincoln’s story of the United States and the Civil War in the Gettysburg Address; the successful mobilization of popular support for the 2003 invasion of Iraq—each relied on the artful articulation of an appealing story. Storytelling can build nations and tear down empires. Storytelling is an essential, if often overlooked and underemphasized, aspect of political communication and coordination. “People need to be convinced, and stories do that and connect them to others. That’s how they connect with others. Successful activists use stories to do it.” Political change, for better or worse, depends on effective storytelling. When I asked Hunt how storytelling can influence public policy, reconciliation processes, and activism, he said all three are about convincing someone. Three things convince people, he said: money, story, and data. Data, he quickly notes, is just “story without a soul.” But story, he says, is the key. 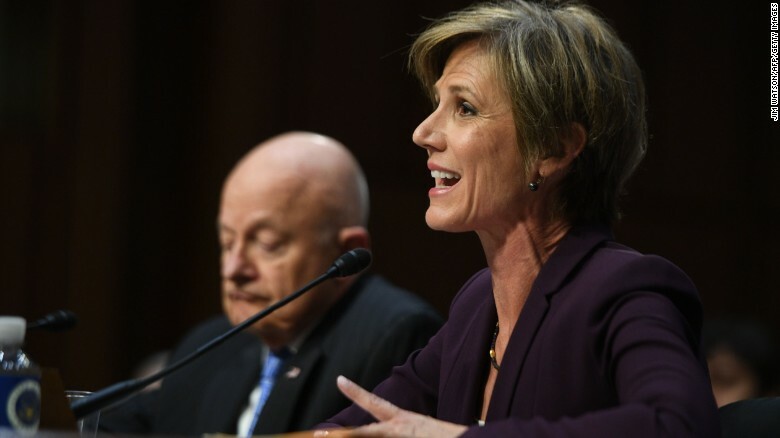 Former National Intelligence Director James Clapper and Former Acting Attorney General Sally Yates testify before a Senate Judiciary Subcommittee on May 8, 2017. Courtesy of CNN. I asked Hunt how he teaches storytelling to organizers and activists. He explained that it is less about teaching how to tell stories than it is about “awakening people’s understanding to how powerful storytelling is to human understanding.” Humans interact through stories, whether they are building alliances or attacking enemies. “Somebody coming at me is using a story.” Our wars, literal and figurative, are narrative in nature. Our most effective weapons are our stories. Not all of our stories, however, are self-creations. Sometimes, we retell and act out the stories told, or imposed, on us by hierarchies and power structures. People are always telling stories, he reminds me, but they don’t alway realize their actions and reactions as based in story. For him, “the goal is to awaken people to the power of story, and they will figure that [storytelling] out.” With greater awareness about what storytelling can do, the stronger activism and organizations advocating change will be. Is a Common Past Necessary for Understanding? I asked Hunt whether we need agreement on history to be able to understand the stories we tell each other. Some, he says, might explain their position based on their religious teachings; others, that their ancestors arrived there first. The first step, he reiterates, is reaching a deeper understanding of the roots the beliefs held by others. “You need to get under to understand. You’ve got to understand history from that other person’s perspective.” In trying to see the world through someone else’s eyes, we are not required to adopt their perspective. We might, however, be moved to appreciate the sincerity of their belief and gain insight into the architecture of their worldview. If we want to modify it, we need to know how it is built first. In training activists and organizers to be effective storytellers, I asked Hunt what he found to be the greatest challenge in his work. “I think it is keeping my eyes on the prize and realizing that people are doing the best they can with the consciousness they have. Rembrandt Peale’s portrait of Thomas Jefferson. In this challenge of consciousness, however, Hunt also identifies an opportunity. “I think the biggest opportunity is what I just said-move people’s consciousness a little further down the line. People are so disillusioned right now. It means the illusion has been taken away. Why are you upset? The truth should set you free! The illusion has been taken away and now more people are in that space of being disillusions and I think that ‘s a big opportunity to move the needle. Disillusionment is our best opportunity.” People’s eyes have been opened and their consciousness shifted a little further. What book and/or film would he recommend to those looking to appreciate storytelling? For a book, Hunt recommended Eckhard Tolle’s Power of Now for its discussion of the mind and how it works. As for a film, he offered The Wizard of Oz, but viewed through an organizer’s lens. Dorothy is an organizer, seeking solutions to collective problems through shared action. She experiences what “organizers see in our society: people without power sent to meet a magical person with the “solution.” Dorothy is sent to meet the all powerful Wizard of Oz who, she is told, will help her return to Kansas. But along the way, she—like organizers—meets “people who don’t have voice, knowledge, or courage but the journey shows them they have those things and then they can overcome incredible obstacles.” And oftentimes at the end of the journey, organizers, like Dorothy, “meet somebody powerful who just got there themselves! The Wizard says “I landed in a balloon and these people made me their king!” Everyone has a story to tell—some to gain power, some to frighten, and some to just get home. Dorothy and her companions, Courtesy of Entertainment Weekly. Great power resides in storytelling—the power to persuade, to compel, to inspire, to unite. Storytelling can strengthen the bonds of community and articulate meaning in a common struggle. It can make great obstacles suddenly surmountable, and daunting challenges ripe opportunities. And most importantly, storytelling reminds us that witches and wizards are only as powerful as the stories we tell allow them to be. David Hunt is a nationally recognized leader and teacher for social change. He is the founder of David Hunt & Associates. For more information about David, organizing for social change, and storytelling, please visit his website www.davidvhunt.com.